Hantsphere is an online local heritage resource relating to the geographic county of Hampshire. You can search and explore material from local studies collections from across Hampshire, including Southampton and Portsmouth. The Hantsphere themes tell stories related to Hampshire's heritage and environment, guiding you through some of the digitised collections to provide information and explain how you can find out more. 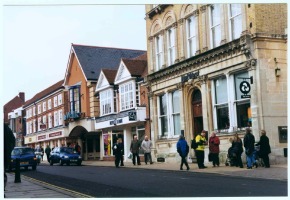 A selection of photographs, postcards, prints, books, newspaper articles, documents and images of artefacts from local libraries, archives and museums have been digitised and made searchable using the content management system developed by System Simulation Ltd. who also now support and host the whole Hantsphere web site. Funded originally by the New Opportunities Fund as part of the Peoples' Network, the project is now run and funded by Hampshire County Council's Library and Information Service.